The CK-10 meets the tough, wet wash down environments of the food processing and chemical industries. Large easy-to-read, one inch tall digits reduce operator fatigue. Selectable digital filtering allows for accurate, stable display reading by removing the effects of motion or vibration. Polished stainless steel construction provides high durability and attractive sanitary appearance. The CK-10 is furnished with an 8-key, water-proof tough mylar membrane keypad. The optional battery pack permits real portability. Over/under graph may be set to illuminate in the form of a continuing bar, a moving dot, or as blocks of color. FRI/EMI shielding – meets NIST H-44 and Canadian SGM-3A guidelines. 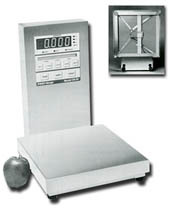 Capacities 0 lb.to 60 lb. Displays lbs., kgs., grams and oz. 60 lb. to 1,000 lb. For application assistance and price quotations, contact us.